Fred Hoiberg at Bulls news conference. Forman is a former ISU assistant coach who said they knew Hoiberg was the right fit for the Bulls after visiting with him this past weekend, saying he is the best fit for the players and the team. The 42-year-old Hoiberg spent the past five seasons at Iowa State. The Cyclones won back to back Big-12 Tournament titles and played in four straight NCAA Tournaments. “The last 5 years have been really, really special times in our lives,” Hoiberg said. Hoiberg thanked Iowa State Athletic Director Jamie Pollard first for taking a chance on him to coach the Cyclones when he was working in the Minnesota Timberwolves front office. Hoiberg says it was a difficult decision and he will always be a Cyclone. “The hardest thing about leaving Iowa State University right now is the players that I’ve built such great relationships with. It’s a special, special group of kids,” Hoiberg said. He says he looks forward to watching the team next year as he says they have a chance to compete for a national title. 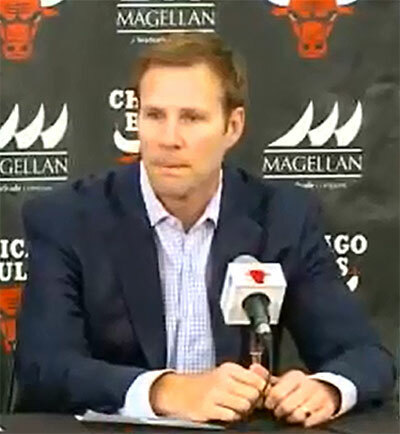 The move has been rumored for weeks but Hoiberg said the decision to move on was made in the last few days. Hoiberg said it was the right situation at the right time. “A lot of coaches don’t walk into this, you don’t walk into a roster that has championship potential,” Hoiberg explains. Hoiberg said he would not have left without the support of his family and says they are ready for the opportunity and says the surgery he had on his heart may’ve played a part in the decision to move on. Hoiberg believes the transition to the NBA will be a smooth one. “I have always run an NBA type system, again I am not coming into this never having experienced NBA basketball. So, I had 10 years as a player and 4 year sin the front office and all that went into the philosophy that I put together as a coach,” according to Hoiberg. As in other coaching searches, the Iowa State Athletics Department will not have further comment on that process until a new coach is introduced.